Little Stacy Neighborhood Park - AIPP seeks to commission a qualified mosaic artist to design, fabricate and install artworks in the park. Budget is $38,000. Local Request-for-Qualifications open March 5 and extended closing on May 2, 2019. TEMPO 2D: Wed, April 3, 6:00-7:30pm, Cepeda Branch Library, 651 N Pleasant Valley Rd. View presentation. TEMPO 2D: Sat, April 6, 11:00am-12:00pm, Little Walnut Creek Branch Library, 835 Rundberg Lane. View presentation. Little Stacy Neighborhood Park: Wed, March 27, 6:00-7:30pm, Travis Heights Elementary Library, 2010 Alameda Dr. View presentation. TEMPO 2D: Mon, March 18, 6:00-7:30pm, Carver Branch Library Meeting Room #1, 1161 Angelina Street. View presentation. TEMPO 2D: Sat, March 23, 12:00-1:30pm, Southeast Branch Library Meeting Room #2, 5803 Nuckols Crossing Road. View presentation. Interested in a career in public art? Through the LaunchPAD program, AIPP pairs established public artists with visual artists moving into the field of public art to gain expertise while providing services benefitting a public art project for the City. 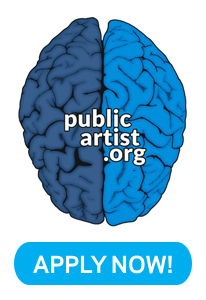 Visit www.PublicArtist.org/AustinAIPP for more information. Get your application in now! LaunchPAD artists are commissioned after a selection process that begins on the 16th of every month. 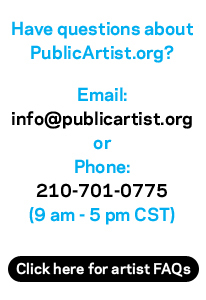 Artists interested in being considered for a public art commission for the City of Austin must apply through PublicArtist.org. All professional artists, with a consistent body of work in any visual art media, are eligible to apply.